Control circuits are often electrically isolated. 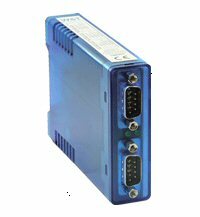 If the controllers are grounded over the control bus and the PC, the entire control circuit might be disrupted by equalizing currents. It must be ensured that the bus is electrically isolated when connected to the PC, or that the PC is isolated by suitable measures such as UPS.